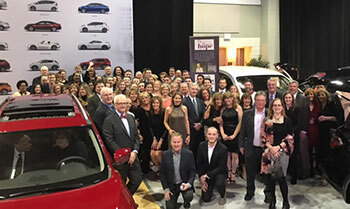 Maureen’s Hope Foundation will again be a beneficiary of the Syracuse Auto Dealer Association’s (SADA) Charity Preview, which is being held on February 6, 2019. The foundation receives 100% of every dollar received from ticket sales and sponsorships, so it is truly an excellent fundraising opportunity. The event entails an evening of unlimited food, drink and live entertainment while you enjoy a private preview of the newest cars and trucks available. It has become one of Central New York’s finest social and networking events of the year with over 2,000 people in attendance. But, the most satisfying aspect of the evening will be knowing that you have helped others in our community by supporting the mission of Maureen’s Hope. Download the ticket order form below for more details on how you can support Maureen’s Hope through the Charity Preview by purchasing tickets or considering a corporate sponsorship. Please be certain to designate your tickets or sponsorship to Maureen’s Hope. Thank you to our November 2017 SADA Sponsors! Visit the Syracuse Auto Dealers Association website for more information about the Charity Preview. For more information about this event, read this article published by Eagle News on January 31, 2012.